Note the ink mark above 3209 in the top right corner. It is the bottom section of J.I. Triplett, President of the Bank, signature from the bill above before they were cut. 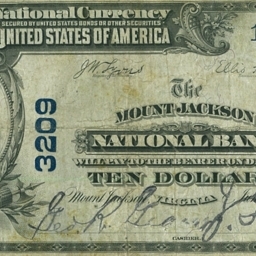 Mount Jackson National Bank, “Mount Jackson National Bank Note,” Shenandoah County Library Archives, accessed April 25, 2019, http://archives.countylib.org/items/show/12412.